"N.S. Bennett & Associates was established in 1961 and have been practicing as Chartered Surveyors in the Durham, Chester-Le-Street, Stanley and Consett areas since that time. I myself have been involved in the survey and sale or property in the Durham, Chester-Le-Street, Stanley and Consett area since 1979 and a MRICS Surveyor and RICS Registered Valuer. Accordingly, I feel that when you are looking for a further examination of any property you are proposing to buy, our long experience and depth of local knowledge will enable us to provide you with an unrivalled Chartered Surveying Survey Service at an economic fee. In addition to valuation reports (which are designed to advise only on the property's value, not it's condition) we can offer two forms of report on the property's condition for your assistance." The RICS Homebuyer report brought out by the Royal Institution of Chartered Surveyors is particularly Attractive when time or money is short. The Survey is less comprehensive than a Building (structural) Survey but Survey but should take into account any major repairs or replacements that the Surveyor considers will affect the value of the property (any minor matters that do not effect the value of the property are not generally reported), provide a Market Valuation, help you make a reasoned and informed decision on whether or not to go ahead with buying the property (as well as what is a reasonable price to pay for it) and help you consider what other advice to take before Exchanging Contracts. When inspecting the property we will cover parts of the structure which are visible or accessible from ground level and the roof space as seen from below the main roof’s ridge line (if it is easily accessible). We WILL NOT inspect the sub floor void, lift floor coverings, move furniture, inspect the cavity or roof surfaces (other than from ground level), or test services. The report will be set on a standard format produced by the R.I.C.S. and any report undertaken are carried out under the Institution’s Standard Terms of Engagement (a copy of which is available at our offices). This is a more detailed examination of the property and provides a report on the construction and condition of the of the same, describing any major visible structural or other defects. Although more detailed, the inspection WILL NOT test services, expose the foundations, lift floor coverings, reach roof surfaces, open up parts of the structure or inspect parts which are covered, unexposed or inaccessible, but any of these additional services can be arranged if required. 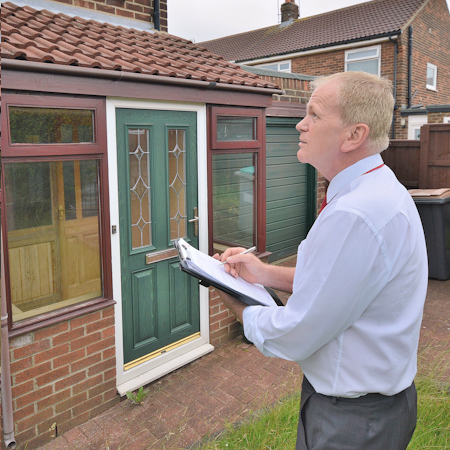 "A few Hundred pounds for a Survey now might save you thousands if defects are revealed."